“Spontaneous.” “Genuine.” Defiant.” The US State Department’s marketeers have used these labels in attempts to differentiate its latest wave of global “color revolutions” from the now tired, ineffective, and familiar formulas used everywhere from the US-engineered “Arab Spring,” to the Euromaidan in Ukraine, to Bersih 4.0 in Malaysia. The latest target is Lebanon where protests have begun in the streets of the capital, Beirut. Branded the “YouStink!” marches, the alleged provocation was dysfunctional municipal garbage collection services. However, very predictably, the protests have shifted quickly from what could have been perceived as legitimate demands to outright calls for regime change. Just recently in Armenia, the US conducted what appeared to be a test run of its new and improved “color revolution” system of regime change. It attempted to create a movement with little if any initial political affiliation and with deeply hidden ties between protest organizers and their US State Department affiliations. Ultimately the so-called “Electric Yerevan” protests, whose alleged grievances were rising electric bills, spent so much time trying to convince Armenians and people around the world that they weren’t a US-backed mob, they never succeeded in building up sufficient momentum to move on to the next step. The trick was to first use rising electrical costs as a pretext to stage the protests, then quickly swing them around to demand a change in government. Likely, provocations and violence were planned for later stages, as well as opportunities for America’s client opposition parties to take over and swell the ranks of street mobs with their supporters. In Armenia, America’s next generation of color revolutions failed. 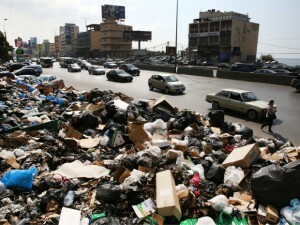 In Beirut, however, it seems that the protests have made it at least to the point where the alleged pretext – piles of garbage – have now been replaced with demands for regime change. Despite the 2005 so-called “Cedar Revolution” being exposed as entirely US-engineered, paving the way for the expulsion of Syrian troops from Lebanon and an Israeli attack on the country the following year, many even in the alternative press have been taken in by what should be an obvious, albeit more carefully concealed, follow-up to 2005’s events. There is something big brewing across the globe and it does not look good. India, Japan and Australia are strengthening trilateral ties while the United States and NATO are looking to firm up alliances between them all along with Ukraine and Armenia. This comes soon after the United States announced they are going to place 2,500 Marines in Australia, in addition to cutting edge fighter jets and transport planes and Australia announced they are going to purchase $950 million in military equipment. This is a large and quite complex picture that requires a great deal of reading and research and I recommend that everyone check out my sources and come to their own conclusions. I can only speculate as to the purpose of these geopolitical developments and I would love to hear what my readers think as well so please email me if you care to share your analysis. I will be going country by country and breaking down these latest developments in order to present to you the most complete information I can, but I am sure this is far more intricate than even I realize at this point. Japan is reportedly partially lifting their 40-year-long self-imposed ban on arms trade which began in 1967. The ban stated that they could not buy or sell arms in concert with nations that had Communist governments or nations at war. Slowly Japan ceased all military cooperation with every nation, aside from the United States of course. This is seen as a move to not only expand military cooperation but also to allow for Japan to get in on the controversial European Anti-Ballistic Missile (ABM) project. Despite the ban on a great deal of arms trade, in the 1980s Japanese corporations outfitted the United States with some 15 new technologies for the Strategic Defense Initiative (SDI). The SDI was proposed in 1983 by the President at the time, Ronald Reagan, and was derisively called “Star Wars” by the program’s many detractors. Now Japan, in a partnership with the Unites States, is in the process of creating a unit for a new, upgraded SM3 ship missile which is expected to become a key component in the European ABM system, according to the Voice of Russia. The head of the Center for Japanese Studies, Valery Kistanov, said, “Above all Japan wants to strengthen its military alliance with the US. Japan needs it amid current instability in the Asian Pacific region. “It is concerned about the so-called Chinese military threat and the situation on the Korean peninsula after the death of Kim Jong-il. The government’s recent move is probably intended to show that Tokyo is loyal and committed to its alliance with the US,” Kistanov added. There is also the notable factor of a growing close cooperation between Tokyo and Brussels – the location of the headquarters of NATO – which would greatly contribute to a greater presence in the Asia-Pacific region. This is just another instance of NATO mission creep far beyond what the alliance was originally intended to do, and as you will see, this is expanding to a disturbing degree just as we saw in the case of Libya. Japan is also greatly strengthening ties between India, starting with a 2008 Joint Declaration on Security Cooperation which was modeled on a 2007 defense-cooperation accord with Australia. This treaty later spawned a similar accord between India and Australia in 2009, leading to circular ties which are now developing into trilateral relations. Japan is also reinforcing economic ties with India with a free-trade accord known as the Comprehensive Economic Partnership Agreement (CEPA) which became active a mere three months ago. CEPA covers over 90 percent of trade and even spreads into the sectors of services, rules of origin, intellectual property rights, investment, customs regulations and other related trade issues. This agreement is intended to strengthen bilateral trade between the two nations in order to reduce trade with China, which still outweighs trade between Japan and India by a large margin. According to the Japan Times, India is already becoming a preferred nation for Japanese foreign direct investment. Japan and India have also come to an agreement on development of rare earths after China leveraged their monopoly on production of rare earths to cut off exports to Japan in the fall of 2010. Japanese-Indian relations go even deeper with an annual summit meeting between the two prime ministers along with several annual dialogues between their respective foreign ministers, defense ministers, and Japan’s minister of economy, trade and industry and India’s commerce and industry minister. There are also separate meetings between ministers of energy and other economic talks, dialogues between the Indian foreign and defense secretaries and the Japanese vice minister equivalents, a maritime security dialogue, comprehensive security talks and even military-to-military dialogues which include regular visits between the chiefs of staff of both nations. To even further cement these relations, Japan, India and the United States have begun trilateral strategic talks which began in Washington just last week. India and Japan already have their own missile defense cooperation agreements with Israel and the United States but they are also looking to develop defense systems in cooperation with each other as well. Despite the economic turmoil at home, the so-called leaders of America continue to pour astounding amounts of money into the Israeli missile defense program. Japan is also planning on employing the F-35 next generation fighter jet, which was developed with nine nations including Britain and the United States. The regulations against arms exports in place previously prevented Japan from joining the development team for the F-35, even though they were asked to join the project. I found this noteworthy due to the phrase “New regional order” which calls to mind the infamous “new world order” concept, which is quite an interesting choice of words indeed. According to Singh, “Burns and much of the rest of America’s foreign-policy establishment, now thinks that India’s regional influence has become comprehensive,” although he is obviously coming from a highly biased perspective. It is quite remarkable that Japan and India are now developing the same type of comprehensive military and economic ties that have so long been the hallmark of ties between the United States and Japan. Singh erroneously claims that the newly formed trilateral alliance is also aimed at helping to mitigate the so-called “gaping hole” which will supposedly be left in the Asian security architecture after the West will remove troops from Afghanistan without establishing peace there. Of course, this is outright absurd seeing as there is no indication that the United States or NATO will actually be leaving Afghanistan. This became clear in November when the spokeswoman for the loya jirga in Afghanistan stated that Washington wanted a complete media blackout over the conditions being set in the new strategic long-term deal between American and Afghanistan. Many of the loya jirga participants complained that they were not being provided with information about the terms and conditions of the long-term deal and Afghan President Hamid Karzai said that so long as some minor conditions were met they would be prepared to allow U.S. troops to remain in Afghanistan for an unspecified length of time. It is quite clear that Singh is parroting the blatantly false line promulgated by NATO and the United States despite all of the proof showing that they have no interest in leaving that theater. Rick Rozoff of Stop NATO (which puts out a free daily newsletter that is an absolute must read for anyone trying to keep up with the diabolical geopolitical machinations going on every day) says the evolution and expansion of the so-called “Asian NATO” is nothing new. In fact, he says that he has been writing for at least 10 years on this subject and yet these developments are generally ignored like far too many other important issues that impact us all. Rozoff points to the fact that Europe was first brought “under the NATO boot” and having finished that has now moved on to the Middle East and Africa. “Asia is the only ‘unsubjugated’ part of the world except for Latin America – which is being saved for ‘dessert,’” Rozoff said. It is clear that Asia is the new focus and this only becomes clearer as we continue to look at recent developments that the West is setting the proverbial sights on the Asia-Pacific region. It has also become quite obvious to even the casual observer that this is aimed at encircling the countries that will not follow the West’s orders, most notably China, Russia and of course Iran. During the recent visit of India’s Defense Minister A.K. Antony to Tokyo, it was decided that there would be a joint naval and air force exercise in 2012 between Japan and India, which would be a first. This is part of the agreement between Japan and India which is aimed at increasing cooperation on “maritime security issues, including anti-piracy measures, freedom of navigation,” in addition to “maintaining the security of the Sea Lanes of Communication to facilitate unhindered trade, bilaterally as well as multilaterally with regional neighbors,” which Singh points out obviously means China. In early 2012 a “Japan-India Defense Policy Dialogue” will be held in Tokyo along with the many top-level meetings between government and military officials as previously mentioned. Then again, the “new regional order” being established by NATO isn’t quite as glorious and peaceful as Singh is making it out to be, and the United States has been pretty clearly goading China in the South China Sea dispute. “India’s and China’s rival aspirations to be acknowledged as regional Great Powers, as well as their quest for energy security, are compelling both countries to seek greater maritime security,” Singh writes. Of course in this case “maritime security” is a not-so-subtle way of saying naval dominance as determined by the clout of alliances and sheer firepower. Singh acknowledges the Indian approach has been opting “to construct a regional security structure with no Chinese participation,” and isolation isn’t quite the phenomenal strategy Singh seems to be making it out to be. Cutting a nation out of the equation while encircling it and engaging in saber-rattling is bound to be disruptive, especially when the nation feels threatened. This is exactly what we’re seeing right now with the NATO ABM program in Europe which is not leaving Russia either happy or reassured, as Rozoff has been extensively pointing out in his newsletters. China is also not quite pleased with these developments, evidenced by China Daily saying that Japanese Premier Yoshihiko Noda’s visit to India was aimed at containing China. They also point to an expected dollar swap accord worth up to $10 billion along with possible increased nuclear cooperation between the two nations. Su Hao, the director of the Asia-Pacific research center at China Foreign Affairs University in Beijing reportedly said that Japan’s move to ease the arms trade restrictions “will complicate security in the Asia-Pacific region,” and thus “will have a negative effect on China,” according to the India Times. This is a pretty clear statement to the United States who has been conducting naval exercises with nations involved in the dispute, arming others and encircling China with their increasing Japanese, Indian and Australian ties. It is also worrisome that Australia has decided to sell natural uranium to India, which is a total reversal from the previous policy which had been in place since India had first developed a nuclear weapons program. The Australian Greens characterized this “unethical, illogical and probably illegal,” pointing to the fact that India is not a signatory of the Nuclear Non-Proliferation Treaty, although I think we all know just how much treaties are worth these days. It is quite clear that uranium sold to India will just replace other uranium which would go to civilian nuclear programs so more uranium can be devoted to weapons grade plutonium production and thus nuclear weapons. This issue dovetails with the concern over America’s new and quite pronounced military presence in Australia, which in combination with the nuclear proliferation is sure to make China a bit concerned. There is also the matter of Australia purchasing some $950 million in military equipment from the United States. The Defense Security Cooperation Agency informed the U.S. Congress earlier in December that Australia will be purchasing 10 C-27J military planes and other equipment like missile warning and radar systems. Washington approved the sale which is being done under the guise of helping “improve the air mobility and capability of the Australian Defence Force to run humanitarian and disaster relief operations in Southeast Asia,” according to the International Business Times. Other items included in the order are: more electronic warfare equipment, portable flight mission planning systems, 23 Rolls Royce AE2100D2 engines, radios, support and test equipment, spares, aircraft ferry and tanker support, training equipment and personnel training, technical data and publications, maintenance trainers and an operational flight simulator. Is this preparation for innocent humanitarian missions like they claim or could it possibly be building up supplies for a greater encirclement and possible future military action? The Filipino Presidential Communications Operations Office announced on December 26 that the Gregorio del Pilar (PF-15) set out from Manila to the province of Palawan on December 23 for her first deployment as a warship of the Philippine Navy, after being handed over by the U.S. Coast Guard on May 13, 2011. The Philippine Navy said that the vessel will act to strengthen the naval security in the Malampaya Oil Fields along with other areas west of the Palawan province. The Malampaya field is roughly 80 km off the coast of Palawan Island, which Is not too far from the South China Sea as you can see in the following map where “A” is the South China Sea and “B” is Palawan Island. While there very well might be closer areas to the South China Sea in the Philippines, the newest patrol frigate can sustain a month-long mission without any need to re-provision and is 378 feet long with a beam of 42 feet. The ship carries 18 officers and 144 enlisted personnel and thus represents yet another aspect of the expansion and encirclement in the region thanks to the United States. According to the KyivPost (Kyiv is an alternate spelling of Kiev), Ukraine hopes that the upcoming NATO summit in Chicago in May of 2012 will strengthen ties between NATO and Kiev. Voloshyn also said that Ukraine and NATO have been engaging in intensified dialogues this year in a clear effort to bring the Eastern European nation into the alliance to further encircle Russia and China. “Of course, we will continue to see NATO as our strategic partner in the sphere of security, reform of the armed forces, and in the sphere of tackling the consequences of emergency situations,” Voloshyn added. The KyivPost adds that the United States Ambassador to Ukraine John Tefft said that the Ukrainian President, Viktor Yanukovych, would also be invited to attend the NATO summit in Chicago in May. Bringing Ukraine into NATO could be a huge boon for those seeking to further encircle Russia and continue to grow the hegemonic Western control as Ukraine is a relatively large nation which shares a border with Russia. According to Public Radio of Armenia, recently the interdepartmental commission which was coordinating the implementation of the Individual Partnership Action Plan (IPAP) between Armenia and NATO held their final meeting in 2011. While Armenia does not border Russia, it is quite close and would provide yet another way to encircle Russia and strengthen NATO’s grip on the region. Ashot Hovakimyan, the Armenian Deputy Foreign Minister lauded the effectiveness of the interdepartmental commission’s activity over the past year in presenting the general assessment of their actions. Armenia’s First Deputy Defense Minister David Tonoyan said that the main areas of cooperation with NATO in the field of defense would be the participation of Armenian so-called peacekeepers in NATO actions along with support from NATO and member states in implementing defense reforms. During the final sitting the results of the implementation of the objectives of IPAP in 2011 were summarized along with the progress they had made towards expanding the cooperation between Armenia and NATO. If nothing else, this much is clear: NATO and the West are expanding far beyond their original stated intentions when NATO was created and now moving into new regions, expanding ties and military dominance, and overall doing whatever it takes to grow the hegemonic control of the world. The direction this is heading is far from pleasant and despite the constant reassurances that this is being done for humanitarian purposes or motivations that seem otherwise innocent, I think by now all of my readers realize this is very unlikely, to say the least. If you have stories or tips on this issue please email me at Admin@EndtheLie.com along with your analysis and opinion. I very well might use what you have to say in a future article!